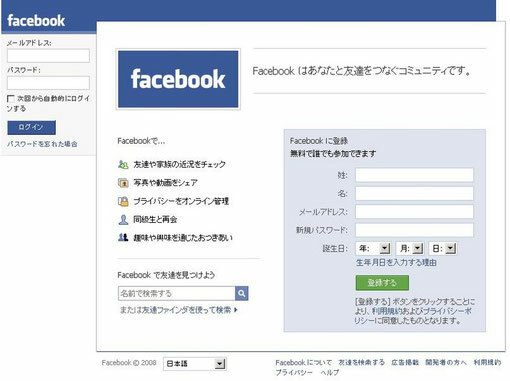 Social Networking Service Facebook has announced the launch of a Japanese language version of its website and services. At a news conference on May 19th, Founder & CEO Mark Zuckerberg expressed hope that more Japanese people will utilize the site, which he said is highly safe, to share information with friends. Facebook again turned to its users and asked them to translate its site into Japanese. About 1,400 users contributed and more than 30,000 translations have been submitted. Already the German and Spanish language sites have been translated with the support of its users. So far, Facebook has not been highly popular among Japanese Internet users. The unavailability of a Japanese language version has constituted a major barrier. Zuckerberg is confident that Facebook will draw in Japanese users because its offerings are different from its rivals. One such difference is that Facebook users provide their real names, which has made the site more trusted. Additionally, in order to succeed in Japan Facebook needs to go mobile. Japanese mobile phones and services are very advanced and people tend to access the internet via their mobile phones rather than with a regular desktop computer. Zuckerberg said that Facebook has plans to start a Japanese language service on mobile phones. However, Mixi - the preferred SNS among Japanese users with 14 million users and an 80% share of the Japanese SNS market - is already offering a highly successful mobile version of its services. It is said that the mobile version of Mixi is already contributing for around 40% of Mixi's revenues. Takuya Homma from Mobinode, pointed out in his posting that a diary function and mini games will be equally important for Facebook to succeed in Japan as these features are very popular among Japanese users and part of the Japanese Internet culture. The Wall Street Journal is claiming that Microsoft had approached Facebook after having failed in its USD 47.8 billion takeover bid for Yahoo. Microsoft already has a USD 240 million stake in Facebook and is said to be interested in a full takeover. While in Japan, Zuckerberg declined to comment the story. However, he stressed his company's independent spirit.